Tootsie Time: Garden Art doesn't have to Cost a Fortune! Make It! Garden Art doesn't have to Cost a Fortune! Make It! These signs (among others) were made by me! I cut two pieces of old barn board, and used chalk to write on them. Once the outline with chalk had been established, I used an old nail to carve out the letters a little bit...I did eventually purchase a rotary tool that makes things go much much faster than with a nail....but still carved the letters in about 1/4 inch into the wood. After that, I used a syringe and some old oil based paint to fill the grooves. A few screws holds them together and that is that! In a future post, I plan to give you some more sayings that would also be great fun on a garden sign. Like my window box? An old window, some more scrap wood and a little paint treatment made me a few window boxes...get it..."window" boxes! lol These hang on the fence. I use a plastic window box pot to put the plants in and have several small drainage holes in the bottom of the wooden box for water to escape. The pump comes from an old homestead site on my parent's farm. I added the gold paint, and a pond pump. A few containers and some river rocks collected from here and there made me a cool fountain...and it only cost me $15 in total. Not bad considering a fountain of this size is upwards of $200 here. (oh...and the plants IN the fountain....FAKE) Any plants outside the fountain itself are real live babies! Now the bike....OH THIS BIKE! I love my bike, but would you believe that it is not that old? NOPE!!! In fact this is a five speed bike that I picked up at a garage sale two years ago for $2! Can you see where we cut the bar out of the center of the bike? A hack saw took care of this for us. The stump is the actual tree that the rest of the house was made from. The apple tree passed away and I needed to use that stump for something...as I cut the tree out AFTER I planted the annuals...so...a little scrap wood, and a saw...some tree branches and there it is! The roof is hinged and it can be used to hold things. It is too low to the ground for a bird to like, but it at one time did hold a spare key....(not anymore...lol) My teapot birdbath really made a splash! For instructions on how to make one of your own....please click here for a Tootsie Tip unlike any other! You will also find direction on how to do the tea cup on a stick that I made to match the bird bath! The old ladder was in bad shape...a couple of fence board scraps cut to size, a coat of paint and some spare screws..and it holds up nicely. I paid $0.50 for it! I am super proud of my bench. I made three in total when I did it! I had been out shopping and saw a smaller less cute version in a shop for loads of cash. I did an estimate (using my body parts) of how tall and wide etc....and went home and hit my stash of barn board....a few short hours later...and I had a rickety old bench to hold flower pots and trinkets for my garden. It doesn't seem to matter what I put on it...It always holds its charm! I think I will cry if it ever falls apart and I can't fix it! Did I ever mention that I love power tools? This is another window. 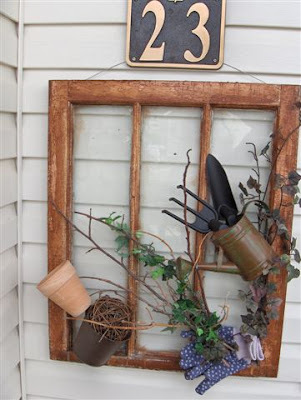 I made the hanger out of old garden junk and one of my salvaged windows. It hangs in the front under my house number! Well...that's it for now...I have a few more projects in the making...but those will wait until I have them done, and planned and easily made...then I will show you how! Have fun making some garden art of your own. If you do...and have ideas....share them...let me know too! Next Friday is the first Fertilizer Friday of 2009.....be ready!